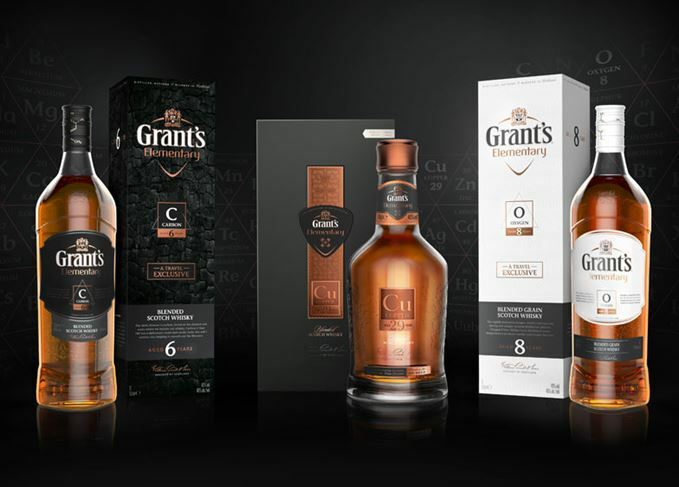 Grant’s has unveiled a novel new collection of blended Scotch whisky inspired by the elements, including a 6- and 8-year old. The Grant’s Elementary range consists of three new whiskies inspired by the elements used in the production of Scotch whisky – Carbon, Oxygen and Copper. The age statement for each expression, while low for two of the bottlings, relates to each element’s position on the periodic table. Grant’s Elementary Carbon is a 6-year-old blend with a presence of lightly peated whiskies for a smoky flavour, mirroring the effect of carbon in the barrel during the maturation process. Grant’s Elementary Oxygen is a blended grain matured for a minimum of eight years, and features a strong proportion of vacuum-distilled grain whisky – a process that removes oxygen to allow distillation at a lower temperature allowing more delicate notes to survive. Grant’s Elementary Copper is a blend of single malt and grain whiskies aged for at least 29 years that features both ‘sweet and smoky’ flavours. Each expression will be bottled at 40% abv, and available in one litre (700ml for the Copper) and 50ml bottles. Brian Kinsman, master blender of Grant’s, said the range is designed to ‘lift the lid on the science behind our whisky’ and highlight the role carbon, oxygen and copper play in the production of whisky. ‘Alchemy is high tech by nature, and Grant’s has been a serial innovator for generations, but our new techniques are always underscored by more than 100 years of Grant’s tradition,’ he said. The range will be exclusively available in global travel retail from 2016. The deal marks the Glenfiddich owner’s first move into American craft distilling. Stella David is to step down from her role as CEO of William Grant & Sons early next year. Is this the best job interview in the world? Grant’s whisky will send applicants on a 10-day global trip as it seeks a new brand ambassador. Monkey Shoulder’s global brand ambassador on video games, cockiness and the trendiest Scotch.